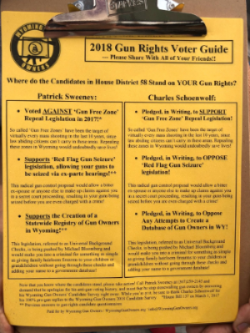 For weeks now, Wyoming Gun Owners has been informing our members and other gun owners in House District 58 about Rep. Patrick Sweeney’s horrible record on the Second Amendment. As a reminder, Rep. Sweeney is one of just a handful of lawmakers who VOTED NO on HB 137, legislation which would have ended deadly ‘gun free zones’ in government buildings here in Wyoming. More than that, Sweeney is on the record as supporting Michael Bloomberg’s signature legislative agenda, universal firearms registration! Sweeney also backs Constitution-shredding ‘Red Flag Gun Seizures,’ which allow you to have your firearms seized via secret court proceedings that you can’t even attend! Of course, if you have spoken with Rep. Sweeney lately, he would deny all of this and tell you that he’s a champion for the Second Amendment. 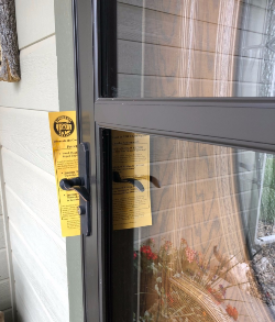 That’s why, in addition to our direct mail and social media efforts designed to give gun owners the facts in House District 58, WYGO volunteers spent all day yesterday in and around Casper, exposing the real Patrick Sweeney! From what we’ve heard, Wyoming Gun Owners will be permanently removed from Patrick Sweeney’s Christmas card list –- but that’s fine with us. You see, unlike most organizations in Cheyenne, WYGO doesn’t exist to cozy up to lawmakers. We exist to expand the Second Amendment rights of law abiding Wyomingites, stop gun control, and expose lawmakers who stand in our path. That’s what we’ve been doing non-stop for weeks in targeted races all over the state. It’s really simple — when a lawmaker publicly flaunts his anti-gun position (especially while being a member of the Republican party,) he needs to be taught a lesson. Yesterday, WYGO did exactly that. The voters will be the ones to decide whether Rep. Sweeney is permitted to hold his seat, or if pro-gun candidate Charles Schoenwolf will be sent to Cheyenne instead. In the meantime, other lawmakers and legislative candidates would be wise to take note of what happened to Rep. Sweeney should they ever think about opposing our gun rights. A big thank you to the members and volunteers of WYGO who spent the day going door-to-door yesterday! If you were unable to join us, please consider a generous contribution to help us pay for this and the rest of our primary election program! Simply put: WYGO has spent heavily to expose anti-gun lawmakers and to make sure gun owners also know about the pro-gun records of so many solid candidates. Since there are virtually no competitive races in the state during the general election, everything hinges on the primary. That means that as we approach the 2019 session, and with it our chance to end deadly ‘Gun Free Zones’ in Wyoming, WYGO will be dangerously short on funds unless something changes. So if you appreciate this aggressive defense of the Second Amendment and our holding anti-gunners accountable, please make a donation today! Some of you are able to offset our entire primary program at one shot with a massive contribution. For others, I know that a donation of $10 represents a very sacrificial gift. Whatever you can do, please know that it will go right to the fight for gun rights here in Wyoming!